Contrary to popular perception, Jewish art dates back to Biblical times. The second commandment declares: “You shall not make for yourself a sculptured image or any likeness of anything that is in the heavens above or in the earth below” (Exodus 20:4). This single Biblical edict feeds the misconception that Jewish art created by Jewish artists is a relatively new genre. Yet, contrary to popular perception, Jewish artists date back to Biblical times, and Jewish artists have indeed depicted anthropomorphic images. The sanction that would more aptly serve as the slogan for much of Jewish art perhaps should be, “Remember the stranger, for you were once strangers in the land of Egypt.” Paired with the repeated biblical command to remember the stranger and the Israelites’ wandering– and the insecurity that came with that homelessness– stands the idea that God’s presence remains eternal and protective, ideas that infuse Jewish art. The Biblical Bezalel–whose name literally means, “in the shadow or protection of God”–was the Jewish artisan appointed specifically by God to build the Tabernacle (Exodus 31:2). So if one defines Jewish art as the works of Jewish artists, one of the earliest works of Jewish art lay in God’s command to Bezalel regarding the construction of the Tabernacle. The Bible details the beautiful work of Jewish hands in the building of the First Temple in Jerusalem under the direction of King Solomon. It is described as overlaid with gold and decorated with cherubim (I Kings 6). The Talmud describes the beauty of the Herod’s Second Temple, declaring, “He who has not seen the Temple in its full construction has never seen a glorious building in his life” (Tractate Succot 51b). In spite of the destruction of the Second Temple in Jerusalem in the year 70 C.E. and the beginning of a 2,000-year Jewish exile, Jewish art flourished in the early post-exilic period, inside and outside the land of Israel, including the Dura Europos and Beit Alpha synagogues. The synagogue in Syria’s Dura Europos, an ancient city along the Euphrates, contains well-preserved frescoes from the third century that portray human figures in biblical scenes. The sixth-century mosaic of Israel’s Beit Alpha synagogue depicts human figures in a scene from the binding of Isaac (Genesis 22), as well as signs of the Zodiac. Talmudic texts also acknowledge the existence and tolerance of graven images. Synagogues like those at Beit Alpha and Dura Europos show that images were not just tolerated but utilized by the Jewish communities. Under Islamic rule, during the Middle Ages and during the Renaissance, much of the evidence of Jewish art is restricted to the construction of synagogues and the illustration of manuscripts. This may not be as greatly influenced by the understanding of the second commandment as by the reality of the Jewish community in those eras. Countries with strong Muslim influences, including Spain, featured much less physical representation of human forms in art than the Northern European communities, because Muslims shun such literal renderings of human forms. Works of Jewish art from this period include illuminated manuscripts like the 15th century Kennicott Bible, with illustrations of King David, Jonah, and Balaam. There are also illuminated Bibles from Yemen from the same period, but they do not contain the portrayal of human figures. The early 14th century Sarajevo Haggadah, also illuminated, was brought to Sarajevo from Spain after the Spanish expulsion and Inquisition. The same Torah that details the ornate beauty of the Tabernacle did not inspire ornate synagogue architecture in this period. While some synagogues in the medieval, Middle Ages, and Renaissance contained stained glass, it was unremarkable. Reasons for this could include the political and economic weakness of Jewish communities tied to church controls and the Jewish communities’ own desires not to draw attention to themselves. More remarkable, however, were the Jewish ritual objects that originated in this time period and continue to be created to this day, all in the name of hiddur mitzvah–the idea of adorning a commandment and the objects used to perform it with beauty. Examples include Torah crowns and finials, Havdalah spice boxes, and kiddush cups. In Western Europe, with the coming of the Enlightenment, a greater acceptance of Jews in the world at large meant that Jewish artists could practice more freely. The late 19th and early 20th century led rise to familiar figures of not just the Jewish art world but the art world at large, including Camille Pissarro, Amedeo Modigliani, Chaim Soutine, and Marc Chagall. Camille Pissarro was a principal impressionist painter who struggled financially to remain true to the impressionist style. 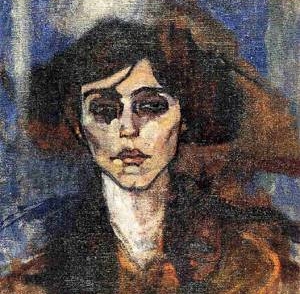 Modigliani, the Italian Jewish painter, settled in Paris and had a painting style that included elongated faces representative of African masks. His contemporary, Chaim Soutine, was born in Russia, but also painted in Paris and was friends with Modigliani, who painted his portrait in 1917. But Marc Chagall, more than these others, incorporated his Jewish upbringing and immigrant experience into his work. Many of Chagall’s most well known paintings are populated with figures of his childhood in Belorussia. The settling and establishment of the State of Israel in the 20th century provided another dimension to Jewish art. Many young, often European, Jews came to the Land of Israel in the pre-state period as pioneers (halutzim), and their connection to the land accentuated their art. Artists like Reuben Rubin, who made aliyah (immigration to Israel) in 1912 and studied at the newly established (1906) Bezalel Art School in Jerusalem, painted in a way that showed love for the land, with romanticized visions of ancient and modern Israel. The work of Anna Ticho, who had studied in Vienna, portrays finely detailed pencil and charcoal renderings of the Judean hills, soft water colors of the flora and fauna around her, and beautiful portraits of the patients, Arab and Jew, who came to her husband’s ophthalmology clinic in their home, where she often worked. The recent immigrant experience is reflected in the works of Mikhail Gorman whose native Russian is used as text in his paintings, while Israeli-born artist Yaakov Agam has created recognizable three-dimensional pieces significant both for their place in the larger Op-Art movement, as well as their interesting usage of Kabbalah and mystical texts as inspiration. And thousands of years after the wanderings of the Jewish people in the desert, some critics understand Mark Rothko’s large canvases with blocks of color as a modern day tabernacle. In this way, Rothko, as with many Jewish artists, was both creating a sanctuary serving as a place of worship and also a mobile place, reflecting the enduring reality of wandering in the history of the Jewish people. Pronounced: hahv-DAHL-uh, Origin: Hebrew, From the root for “to separate,” the ceremony marking the end of Shabbat and the beginning of the week. Pronounced: YAH-kove or YAH-ah-kove, Origin: Hebrew, Jacob, one of the Torah’s three patriarchs. An introduction to Jewish visual arts from Bezalel to the 21st century. Folk art even the poorest folk could create.